After a great stay in Patagonia and a great experience in the national park Torres del Paine, we are now back on the road, but a specific road that is the road of the wine in Argentina. 🙂 No more hiking trails but visits of Bodegas in the best area in the world to taste Malbec and other good wine productions. It starts in Mendoza finishing in the north, around Salta, going through beautiful valleys that we are very excited to discover. We arrived safely in Mendoza from Santiago after a 8 hours bus ride. 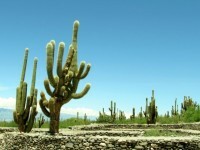 The journey between the two countries go through the Andes offering an amazing view and colorful sceneries. We had to pass the border in the afternoon and were worried about the amount of people waiting as this is a popular crossing border. At the end, everything went well and fast and after having filled out some paperwork, declared goods, checked our bags, we made our way to Mendoza. The first impression we have had of Mendoza was neutral, to be honest we thought the city was nothing exciting and a bit deserted… But it was for a good reason, The “Siesta time” ! Maybe we were the only ones in doubt, but the Argentinian dedicate 3 hours of their time in the afternoon for the siesta, between approx. 2pm and 5pm. Between this time, everything is closed (or almost) and don’t expect to find restaurants open. It is also considered to be rude to call people at that time..! We learnt a lot about the city and its culture thanks to the Free City Tour we took the day after. As mentioned in our previous articles, it is one of the best and economic ways to discover a city in South America with some locals! After that we went to other different plazas with a lot of Spanish influences. One of them leads to the Governors building where it is possible to go on top and have a look at the entire city. The view with the Andes in the background was really nice. We ended up the tour in Plaza Independencia, the main Plaza with an overview of a beautiful fountain. It is actually a park that is usually used for small concerts, local markets (ferria) and so on. It can be indeed very lively at times. The tour was a great tool to have the big picture of the city and to get some recommandations. Our hostel, The Empedrado, was also great to get recommendations and get to know new people. It was actually one of the best hostels we’ve ever had in term of atmosphere and value for money. The rooms were clean and comfortable and the hostel offers every day an amazing breakfast with crêpes, eggs, fruits and bread. They also propose every day some free wine between 7 and 8 PM. We met many people during those evening and made some nice new friends. We decided to stay three nights to completely emerged in the Argentinian culture of Mendoza and to take the time to visit the different wineries (bodegas) and wineyards of the area. The next day, we decided along with our new friends from the hostel, to visit the wineyards of Maipu, a small village next to Mendoza where there are more than 12 wineries! There are various forms to go through the wineries including touristy tours but by far the cheapest is to take the local bus to Maipu and to rent bicycles directly there. We chose Hugo’s bikes which was the most recommended one. We paid only $70 pesos for a day including a map of the area with the wineries. We took off first to visit one of the oldest winery of the area, the Family di Tommaso where they have kept the old distillery intact. It’s about 6 KM from Hugo’s bikes but well worth the ride. Beautiful trees cover the road to the wineyards. When we got there, we were welcomed by a member of the family that took us on a tour around and inside the property. The tour was only $45 pesos including 3 wine tasting. It was definitively very interesting to learn about the culture of the wine and its different sort of grapes and productions. From Sauvignons to Pinot Noir, we appreciated a lot the good and tasty Malbec. Our next stop was another wineyard about 2 KM, called Mevi. This one was a bigger wine producer and had a restaurant where we could finally eat something. Another taste of three wines for $45 and lunch was on the menu. The highlight of the place was definitively the view on their property and the yard from the terrace and the comfortable seating. After having had something in our belly and another glass of wine, we continued our journey to a Vinoteca called “La Botella” which we highly recommend.It is probably the place where we had the best and cheapest wine for 4 wine tasting at $30 pesos plus a free bottle as a gift to take away at the end ! The owner also offered us a generous offer of 4 bottles of the best wine at only $100 pesos ($11 dollars). For the 5 of us, there was no way to resist that offer. We left the place happy and, maybe, a little tipsy but good enough for a last stop at the Olive and Chocolate production. It was actually the best way to end the day as we could taste bread with all kinds of sauces made of olive oil. We could also try chocolate and, of course, we couldn’t leave without the 2 shots of liquor they offer as part of the degustation. 🙂 Let’s just say, it was a fun ride back to drop off the bicycles after this full day of wine tasting. Hugo had nice glasses of cold lemon juice ready for us when we came back. At the end, he wouldn’t let us leave without giving us a bottle of his house wine as part of the tour.We really had more wine than we knew what to do with. But it never got to waste, that’s for sure! We had a really good time in Mendoza discovering the culture of the wine and the beautiful scenery all around. We highly recommend Mendoza for wine lovers. We can definitively say that this area offer excellent wine at the best competitive prices worldwide ! 110 pesos in dorms, free laundry service, breakfast included and free wine tasting on Thursday. Crossing the border from Chile:Bus company El Rapido Internacional or Andesmar. No food can be imported in Argentina. Visas: For citizen of the United States, Canada, or Australia, a reciprocity fee must be paid in advance – $160 for Americans, $100 for Australians, and $75 single-entry or $150 multiple-entry for Canadians. Further information to be found on Argentinian Department of Immigration website. 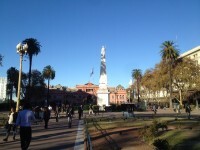 Getting Around: Mendoza is a very compact city, it is very easy to walk around. No car or buses are needed. To visit the surrounding villages, a bus card must be bought in any kiosk for 10 pesos. Otherwise the buses system work also with coins that must be paid with the exact amount. Getting to Maipu: Go to La Rioja street between Garibaldi and Catamarca. Take either bus 171, 172, or 173 and ask the driver to let you know when you get to Mr. Hugo’s bikes. Road trip in the north of Argentina !